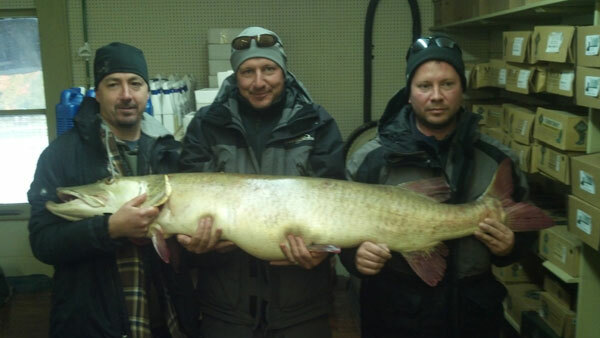 Joseph Seeberger of Portage, Mich. (center), displays the 58-pound Great Lakes muskellunge he reeled in during an October 2012 outing on Lake Bellaire. Brother Chuck Seeberger (left) and friend Jason Orbeck (right), both of Battle Creek, were on hand for the big catch. The International Game Fish Association (IGFA) has compiled a list of what it considers to be the best record catches of the past year, which includes a world-record Great Lakes muskellunge caught in Michigan. The muskie is part of the IGFA’s 10 of the Best Catches of 2013 effort, which is now asking anglers to vote for their favorites. The voting contest launched on March 1 at www.igfa.org/contests/AnglersChoice. The catch that receives the most votes will receive the Angler’s Choice Award at the IGFA’s World Record Achievement Award ceremony in April. Voting takes place until March 31. Voters are limited to one vote per day throughout the month. The Great Lakes muskellunge was caught on Oct. 13, 2012, on Lake Bellaire in Antrim County. The state record was caught by Joseph Seeberger of Portage, Mich., and weighed 58 pounds and measured 58 inches. It was listed as a world-record catch by the International Committee of the Modern Day Muskellunge World Record Program in February 2013. It should be noted the muskie is the only fish in the contest that was caught in the United States. Catches were selected based on difficulty of the species, size of the fish, tackle used, and the history associated with that particular record. The IGFA is an organization committed to the conservation of game fish and the promotion of responsible, ethical angling practices through science, education, rule making and record keeping.